Yesterday, I attended the NW Children's Foundation event "Community Trauma and Child Well-being" that brought together four amazing panelists: Shawn Ginwright, PhD, Ben Danielson, MD, Kaaren Andrews and Sheila Capestany, MSW, MPH. This event was very inspiring and reinforced again the important social justice and racial healing work that is happening in Seattle. I wanted to share some of my reflections from this event. Did you know that The Best Start for Kids Initiative was approved as a $400 million dollar Levy by King County voters 3 1/2 years ago? There are 2/12 years left. Sheila Capestany is a former Doula who is now the strategic advisor for BSK and described the plan to help put every baby born and every child raised in King County on a path toward lifelong success. BSK invests in prevention and early intervention strategies that promote healthier, more resilient children, youth, families and communities. It is considered the most comprehensive approach to early childhood development in the United States, starting with prenatal support, sustaining the gain through teenage years, and investing in safe, healthy communities that reinforce progress. I was very excited to hear from Ms. Capestany because I will be working with three other consultants (Ratnesh Biren, John Perkins and Teresa Poskony) as CORE - Consultants on Resiliency and Equity. We are part if a larger collective of consultants from across King County. We will bring equity training as well as reflective practices and supervision to Early Care Providers through this Workforce Development Grant funded by BSK. I am thrilled to be a part of this incredible collective. Ms. Capestany shared that what keeps her up at night is realizing the magnitude of the political and institutional will that is necessary to carry out this work. She shared some visions that she has for “Courageous Change” that will eventually shift the county budget fully toward prevention and promotion of health, happiness, safety and thriving for all citizens in King County. Two quotes that I am appreciating from her talk are these: “I want to create a north star for our community” and “I am going to move with love.” I am ready and eager to follow her lead and to bring the same measure of calm, focused and loving attention to my work. I really appreciated the transparency and authenticity shared in this group of leaders and their steady determination to foster healing we need for social liberation to become a reality. As soon as the NW Children’s Foundation shares the slides from the event, I will post them here. This time of year is a potent time for self-reflection. We are moving toward the winter Solstice on December 21st. This is the shortest period daylight of the year and the longest night of the year! Here in the Pacific Northwest, we experience a dwindling of the vibrant energy the sunlight provides and a subsequent slumbering effect that calls us inward. The word solstice translates roughly as “sun stands still.” This time of year you can live in alignment with this final turn of the calendar by leaning into this slowness. Settle in and enjoy the opportunity to pause and consider your life path. Be inspired by the words of Robert Frost. His poem, “Stopping by woods on a snowy evening”, captures the moment of a reflective pause when he stops in midst of dark night of snowfall on his journey home on the Winter Solstice. Reading his words, I feel myself exhale into the hush of winter with appreciation for the beauty that resides in any intentional pause, even when we still have much to accomplish! How can you use resilience as a guiding concept for your life right now? What experiences this year provided the insight and healing you need to move forward? How can you honor your unique path for thriving in 2019? Working through this material, you consider your experiences in 2018 and respond to specific questions for self-reflection. Meditation practices are designed to highlight the feeling of resilience in your body and your capacity for creating calm. The process includes creating a mixed media collage with intuition as your guide to inspire your unique path for thriving in 2019. Taking time to look back, be present and integrate the lessons from the past, you are guaranteed to align with your true purpose moving forward in the new year. Order your workbook and register for an RR workshop today! I will be at the Seattle Mindfulness Center on December 29th, 2018 from 10-2pm. I will be at The Cloud Room on January 6th, 2018 from10-2. I am available to work with your team to facilitate this process. Healing justice means that we make central to our work listening to those who are re-imagining justice as a process of transformation. This past Saturday, I attended an inspiring event that was part of the Let’s Talk Race series at the Youngstown Cultural Arts Center. I was excited to be a part of the group of about 100 people who came together to watch the new documentary Healing Justice by Dr. Shakti Butler. This film explores the causes and consequences of the current North American justice system and its effect on marginalized communities. The film walks back through the history of violence that has led to our current system, bringing into focus the histories of trauma – on a personal, interpersonal, community, and generational level. This powerful documentary addresses the school-to-prison pipeline, the need for comprehensive criminal justice reform, and the importance of healing and restorative practices. This year, I have been studying Peacemaking Circles with Dr. Pamela Taylor and looking for opportunities to learn about Restorative Justice. I am convinced that we need to replace our current punitive and racist system with restorative practices. Restorative practices have the capacity to address the root causes of violence. When we take time to address underlying trauma and systemic oppression, we begin to repair the harm that is caused while maintaining connection. When we create a system that is truly committed to maintaining relationships rather than fostering disconnection, we can heal. In the conversations at the event on Saturday, I walked away hopeful that we can dismantle the structural racism imbedded in the criminal justice system. How does trauma impact us personally and interpersonally, as a community and throughout generations? How can restorative practices, such as restorative justice, be used to shift the way we address crime and violence in our communities to produce safer, healthier, thriving communities for all? This movie reinforced my commitment to volunteering with What’s Next Washington a local 501(c)(3) nonprofit composed of formerly incarcerated individuals and allies working together. We convene, support, and scale organizations with the goal of replacing mass incarceration with anti-racist solutions that work better for everyone. Our first priority is to significantly reduce recidivism. Because the two key drivers of recidivism are the inability to find a job or a place to live, our efforts are focused on employment strategies and housing strategies. We work with community members to develop policy changes and a culture that welcomes people in – so that all of us can thrive. Like The World Trust organization, WNW is developing interactive events to change the public’s perceptions of those who have been formerly incarcerated. Our next fundraising event will be on Dec 10th and it is called The Stigma We Carry. We could use your support! Consider joining us for this evening of stories of resilience as we foster a new narrative about what healing justice can be. You will hear from the formerly incarcerated, drug addicts and those who have been cast out of society. This is an interactive evening. Expect to learn about how people in our community are overcoming addiction, trauma, and the stigma of incarceration, and experience a night of reflection about collective healing rather than collective harm. At WNW we are contributing to a new vision of what healing justice really could look like. Please join us! On October 20, we hosted the Introduction to Prepare to Pivot at the Cloud Room. With Christina and myself co-facilitating, it was an intimate group of five. We dove right into the PTP material and touched upon all the key aspects of the full course. We explored the 3 central phases of PTP from Self-Discovery to Visioning to Action. We appreciated the chance to try out this condensed version of our workshop and to meet the courageous individuals who decided to join us. 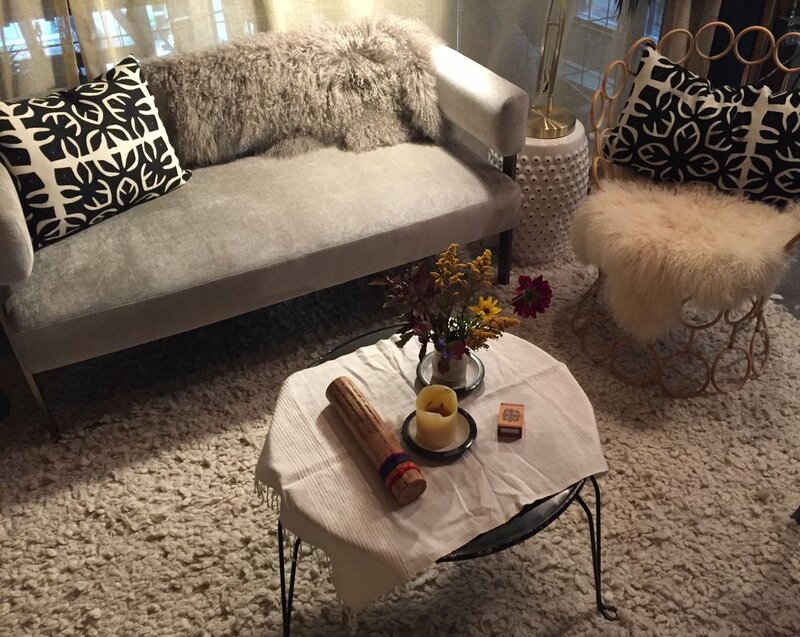 We began by creating a warm, welcoming and clear space for self-discovery. Healthy group dialogue - an essential part of Prepare to Pivot. We use exercises for self-reflection to help you identify your values. After a guided visualization, we use collage to tap into intuition. Healthy snacks support the process! What a great experience to work with you! We look forward to the full offering in 2019! Christina and I created PTP because we know how hard it can be to pull off a pivot! Listening to these amazing women speaking their truth, we heard about some of the obstacles (both internal and external) that they are facing. We were reminded of our own struggles, those we have heard from others, and the need to dream BIG! Deeply inspired by their passion, drive and determination, we encouraged them to take healthy risks, challenge their assumptions, and clarify what new skills and capacities they may need to develop in order to succeed with their pivots. 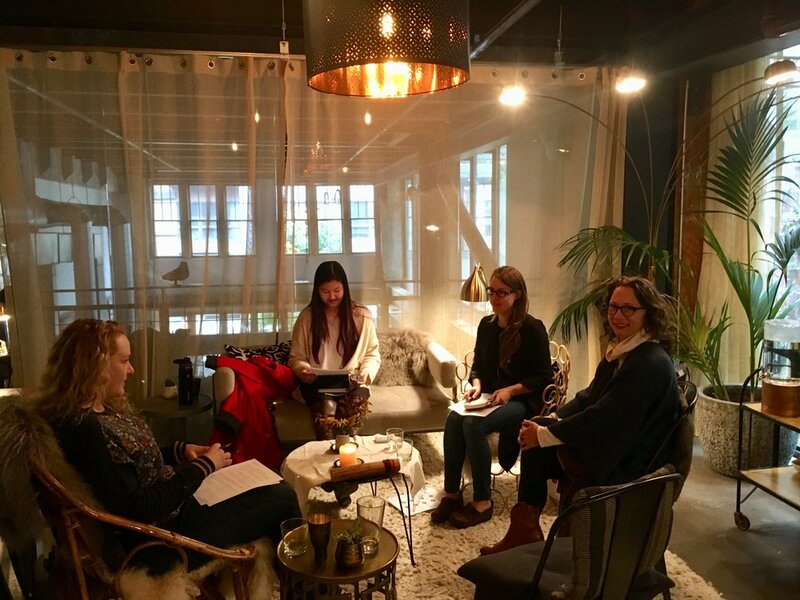 This small group experience at The Cloud Room reminded us that when you take the time to create a clear and compassionate group, insight and wisdom always emerge. It was an inspiring day for us all. 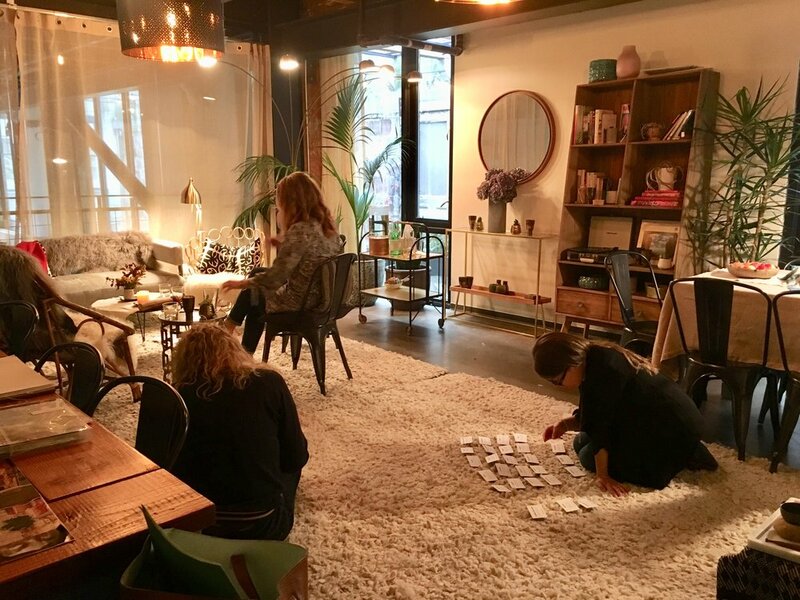 The Cloud Room is a wonderful space to offer our full workshop in January and we hope to connect with them (and you) in 2019! Hope to see you at The Cloud Room! We need courage to do the right thing. We need courage to face our fears and stand up for ourselves and others. At times, we need ordinary courage just to tackle our everyday responsibilities. This past year, I made a commitment to myself to seek out opportunities to be more courageous in my life. I committed to taking risks personally and professionally. As a result, I have felt vulnerable, insecure, agitated and anxious. And at the same time I felt myself becoming more authentic, more humble and more deeply imbedded in my community. Through these learning expeditions, I have connected with new people who are also leaning into fear. I discovered that courage is contagious! In these adventures in courage, I have been reminded that taking risks requires energy. Stepping out of my comfort zone needs to be balanced with moments of self-compassion to pause and integrate what I am learning. Mindful self-compassion helps me to regroup, regain my composure and settle into the new version of myself. When I balance courage with compassion, I find a deep union arising. I feel myself becoming the person that I need to be. Today you will read about a few different people who inspire me to find this balance between courage and compassion. I hope that you will read on about how they are bringing their gifts, passion and wisdom to the world. I am sure that you have people in your circle that are living examples for you. I would love to know more about who is inspiring you to take risks, live more courageously, and balance acts of courage with self-compassion. Write me back and share your stories and your connections! I met Susan Mason in a Mindful Self-Compassion course at The Center for Child and Family Well-being (CCFW)! I was immediately drawn to her. She is wicked smart, funny and doesn't hold back. Sue brings her full and honest self to every interaction. Sue is the co-founder of What's Next Washington a non-profit organization of formerly incarcerated individuals and their allies who seek to significantly reduce recidivism. Dedicated to having courageous conversations about the stigma's we carry and how to address bias and discrimination, WNW works tirelessly to create employment and housing opportunities. This Tuesday October 2nd, I will attend The Stigma We Carry an interactive fundraising event designed to educate about the stigmatized identities of incarceration, homelessness, poverty, mental health disorders and addiction. I hope you can join me at this event! Doors open at 5:30 and the show is from 6-8 pm. Interested in coming, but short on cash? There are tickets available so please let me know you want to come and meet Sue in person! This work is important and it won't happen without funding so if you are able you can also donate even if you can't attend the fundraising event. A few years ago, Andrea D'Asaro reached out to me through my website and we met at the Seattle Mindfulness Center. We connected immediately and have sense shared many conversations about mindfulness, resilience and how to support courageous action with self-compassion. Warm and open, Andrea always has a great story to share about what she is learning from her students and her life. 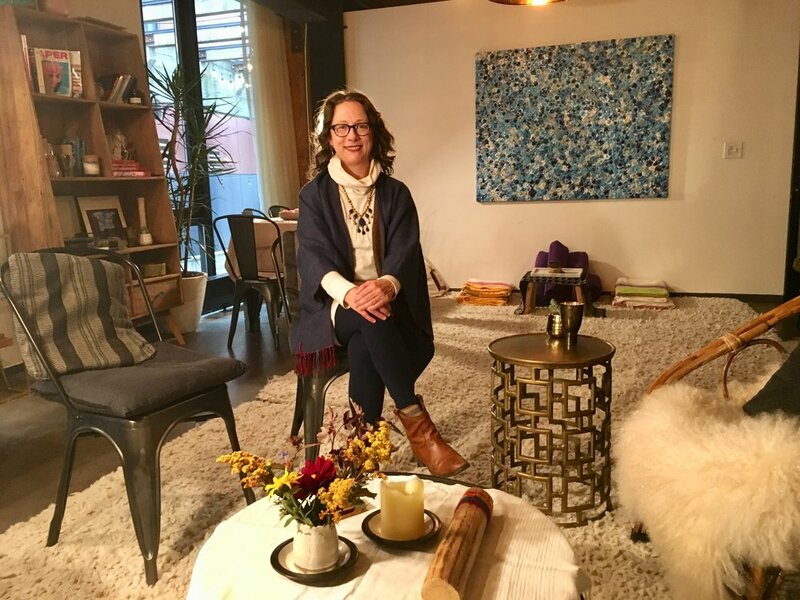 She is committed to teaching others how to tap into mindfulness in simple ways by incorporating small moments of stillness into their everyday lives. She has a grounding presence and creates a supportive environment to discover new ways to bring joy into each day. If you are looking for a mindfulness coach, a mindfulness tutor or ready to take a course this October to explore mindfulness based stress reduction (MBSR) consider her course Mindfulness Meditation for busy working people at North Seattle College. Check out her website here. These two women embody the powerful combination of fierce courage and deep compassion that I aspire toward! Together, they co-facilitate Listening Mother's groups - a joyful and compassionate place for moms and babies to pause and be together in a supportive community with others. This amazing series offers a mix of learning about information that helps nurture the mom and baby bond while engaging in mindfulness and self-compassion based practices that help enrich the present moment. They seek to nurture the ever-evolving relationship between child and parent. The LM groups are for moms with babies 0-6 months old. A deeply meaningful space for mothers that is built around a curriculum of self-compassion, attachment & bonding theory, mindfulness practices, this space allows for emergent wisdom to arise within the group. It is a rare space for mothers to share and listen to one another in a supportive and non-judgmental space that welcomes the unique and universal discoveries that each woman is going through. The group includes discussions, mindfulness practice, sharing of wisdom from the women in the group, ritual and poetry. While I have never had the opportunity to participate in a Listening Mother's group myself, I have seen the lasting impact that the group has on women and their babies. You can learn more about the class and how to register here or simply email Carey at cdemartini@seanet.com or visit her website. This morning with my window open, I am receiving the cool air as a gentle reminder that summer is coming to a close! I can see the sunflowers standing tall and reaching upward, but there is also an awareness that soon the leaves will fall and those seeds will scatter on the ground offering nourishment to birds and squirrels and the delightful possibility of more sunny flowers next summer. "Your character is opened, deepened, strengthened, softened. You return to your soul's highest values. You are now prepared to create your legacy: an imprint of your dream for our world—a dream that can fully come true in The Second Half of Life." Working within The Road Map Project, I had the chance to use my skills as an artist and capture collaborative problem solving in real time. Working as a graphic recorder, I listened and then created a record of what transpired. I was truly amazing and I learned so much from the parents who participated on the leadership team. As a Connect Facilitator at the Discovery Session for Middle School Youth at Caldera Arts Summer Youth Camp in Oregon, I helped youth to integrate all they were learning through arts in the natural world. I focused on ways to connect with themselves, one another and the natural world. The youth were strong and creative and the teaching artists were dedicated and shared their gifts so graciously. It was hard work and felt honored to be a part of such a powerful program. Indigenous Voices: Part, Present and Future was the focus of this inspiring intensive. The Double Exposure Show at SAM allowed me to consider the complexity of the historical treatment of Native Americans, their contemporary radiance as artists, and their incredible resilience despite systemic oppression. Pictured here is Printmaker Fox Spears who writes: "The art that I make is intended to help fix the earth and build new Indigenous futures." I hope you will write back and share your summer reflections with me! I am excited to share my second interview for the Prepare to Pivot launch that is happening this month! In 2016, Charles Morris had a vision for using mindfulness to promote a growth mindset at Microsoft. Charles has worked as an engineer at Microsoft for 16 years and has taught meditation outside of work for 10. I sat down with Charles to learn about his recent pivot. He was warm and open and so candid about the internal dialogue that contributed to his pivot. The inspiration that I took away from the conversation is still resonating in me as I write this! I am excited to share this with you. Let’s start with how you heard the call to pivot. For me the call came in early 2016, about 2 years ago now. At that point, I was in a comfortable place at Microsoft where my job was going well. I was comfortable. It was challenging me at a certain intellectual level. Outside of work, I was a practicing Buddhist, and this spiritual perspective helped me to view my work as a training ground for me to develop my capacity for calm and build my ability to stay focused within the hectic realm of Microsoft. It also was an opportunity for me to practice my desire to be of service to others. This was rewarding and beneficial and something I remain committed to now, but it was an inward practice. It felt secret. On the outside, my spiritual practice and my professional life were separate worlds. So then the call to pivot came. I wasn’t looking for it. It started with a couple of simple things. We had a new CEO, Satya Nadella, and he exuded a different energy. He used different words from day one like compassion, empathy, purpose and finding a growth mindset. From the beginning, I could feel from him a genuineness that came with the words. The second piece that fell into place was learning more about the secular mindfulness movement. My training to date was in a Buddhist context. I had managed to shield myself from this amazing movement (the secular mindfulness movement) that has gone on in the past 10 years. I had a conversation with a friend who was preparing to teach a simple meditation gathering at his workplace. He knew that I was a long time meditator and that I had 10 years of experience teaching meditation. He asked me for advice and told me about the Google program “Search Inside Yourself.” It made me stop and think, I need to look into this. That curiosity percolated for a few months and grew into an eagerness to be part of the change that I was seeing in the company from adopting a growth mindset. I knew that mindfulness could really help shift the culture and make this idea real. That summer, I had time off and so I read books. I learned what other organizations were doing and about the science that was supporting the use of mindfulness. I thought, Wow. I know how to help people with meditation practices that can shift them into a growth mindset. I can offer some specific techniques that will be powerful and practical. If I don’t do this, who will? Later that summer, I worked on a proposal that I eventually published on my LinkedIn profile. I also realized that I needed to retool my skillset to teach in this new secular environment. I signed up for a Master's in Mindfulness Studies at Lesley University. This additional practice and training on the neuroscience of meditation, mindful communication and leadership broadened my skills and fortified by confidence. Those were the first dominoes that really started a chain reaction of events. When you wrote this proposal on LinkedIn did you have a clear picture of who would read it? Tell me about that. It wasn’t my initial thought to publish it publicly, actually. It was written for an HR or other leader within Microsoft, basically, as a pitch to say: “We need to do something here. We have this momentum internally around growth mindset and this movement around mindfulness is happening around us. If we can bring these together it could be a powerful opportunity. I titled it Accelerating Microsoft’s transformation toward a growth mindset with mindfulness. One of the lines that really resonated with me was Changing our culture means changing our people. I was interested in uniting my personal journey with what was happening around me. We are always so externally oriented – even when a company’s culture is changing, there can be a desire to wait for it to "come to us". I wanted to flip this focus back to the individual and the possibility of changing from within as the precursor to broader cultural change. Yes! This is the same gesture of PTP. Tune into the call from your intuition. Then articulate that vision so that you can be the change that you want to see in the world. You are so clear with your vision! I believe that your practice with meditation has surely helped you to be so tapped into intuition. I am curious what it felt like when you found the words and then you put that out on LinkedIn. First of all, just writing was an energizing process. Writing down my ideas was for me as much as much as for others. The more I wrote the more I believed! At first I circulated the proposal inside the company to just a few people and then got some traction with a particular leader at work. That was in the Fall of 2016. The decision to publish came a bit later and then the same friend encouraged me to publish it publicly. That was an interesting process for me. Largely my work persona was very much still as an engineering person. Some people knew that I was a meditator. But there was an aspect of this that felt like I was “coming out.” Once I did it start to bring these two worlds together, it felt great. Now it is very much part of who I am at work. It allowed me to bring more of my whole self to work. This shift has been energizing. Initially when we feel that it is time to make a pivot, there can be fear. Often times the things we are afraid of dissolve when we approach the fear rather than avoid. The energy comes because we dissolve the thing that we are afraid of. What do you think about this idea? I think that energy came from multiple places. Writing for myself allowed me to see a new future arising that was previously hidden and not in my consciousness. That was energizing. I worked with a coach to understand more deeply what was holding me back from making these dreams my new reality. I started to look closely at aspects of my life that contributed to me being someone who is hesitant to stick out. One example was remembering how my parents moved from Singapore to Vancouver, Canada in the 1970s. I recalled how they raised us as Canadians so I learned to speak French and to play hockey. In hindsight, I think that part of the reason was that they wanted us to fit in, partially because we stood out as Asian (my dad is Indian and my mom is Chinese). For that and probably other reasons, I was always more comfortable fitting in. Once I started to examine that hesitancy, I began to recognize that maybe I no longer needed that. I realized that the feelings and experiences that I had from my past didn’t need to continue to limit me. So letting go of these limiting beliefs was also very energizing. It can be so powerful when we see the way that a role that we took on in our family of origin may have served us. And then to realize that we can be step into a new way of being that might allow us to become an agent for social change or even a leader. Yes, I turned 40 in the middle of all this. I was learning from my wife about the theories of Carl Jung, and the process of becoming a whole and integrated person – what he calls individuation. What an amazing process if you lean into it. Yes! He provided a map to help us to connect the dots and find our way into our unique and individual path that is our true adulthood. I am hearing that there were a few key people who affirmed you and supported your pivot. I am wondering if you had an encounter with the Naysayer? This could have been an internal critic or an external obstacle. Can you recall an experience where you really encountered negativity or resistance? Yes, the first part was actually pretty smooth. I ended up running a pilot meditation program called Mindful Growth with 30 people in the spring of 2017. The results came in early summer and they were off the charts positive. Everything seemed to be smooth sailing. I was still feeling super energized but it was a side job. I started the think: What is the next step? I spent some time dreaming big and asking myself: How do I reach more people? I knew I would need more time to devote to the program. I thought: Surely the company is ready to jump on board. I started to pitch the idea of a full-time role for me to lead this around the company. I got some time with the Microsoft wide team that creates employee programs. Initially, there was positive response: This is great! How can we do more? Yet, as soon as I really started to try and pin down a specific role or job that I could occupy, things became elusive. They kept leading to dead ends. Not an explicit, No, but the interest would fizzle. So this external resistance gave rise to the internal Naysayer. I couldn’t see a path forward. At one point I thought: Maybe, this is not meant to be. That was shocking because I had always carried the belief that this was meant to be. It was the first time when I really thought: Maybe I am wrong. Then the doubts became deeper: Maybe I need to go back to my old job or consider something more radical like leaving Microsoft. That was the most intense moment of self-doubt. How I came through that was to actually stay with it. Not paying attention to the exaggeration that the mind wants to create: I’m not good enough. While at the same time deeply accepting the external signs that were undoubtedly arising: No job is appearing. Once I could hold that space, the practice was really to not rush into any decisions, but to let it happen. At that low point, I wrote down a longer email but there were two key insights: I am feeling frustrated. This was the first. Acknowledging these feelings helped me to be realize that something needed to shift. The second thing was: It feels like Microsoft is just not ready to support this work. This was my way of accepting that this was not the right time and that’s okay. Opening that door, but not begrudgingly – who knows, it could be the right time soon, just not now. It was a big moment for me. Since then the right balance has emerged for me between continuing in an engineering role but also being able to pursue the program and spend time on it. I am building momentum with case studies and pilot programs around Microsoft. I have let go of thinking: Where is this going to end up? I have just started to focus on doing the work. I want to get out of pitching a job and get back to working with people and helping them in the way that I wanted to help. We’ll see where it goes from there. Sounds like you have found a balance between these two aspects of yourself those two parts of yourself that were not very integrated previously. Yes, I do feel that way. I thought that I was going to make this drastic switch. It can be very powerful and energizing when the new vision emerges. But I think we also have to be very careful about falling in love with it and believing that its going to be this switch that gets flipped and our life will just change dramatically when in reality it is going to be a process. I tend to be impatient and think: This is the future. Why can’t we make that now? I can’t assign blame outward. I need to listen, enjoy and appreciate, realizing that the outward challenges are a reflection of internal obstacles. So, I can focus on turning over the internal obstacles and let whatever is meant to happen with the program at Microsoft arise. There has definitely been some letting go of expectations and finding a balance. I am still holding that vision but letting go of grasping tightly onto exactly how I think it will turn out because we don’t actually know. I’m also re-embracing parts of my life that I was in too much of a hurry to leave behind for that shiny future. I appreciate so much what you are sharing about this tension between the seeing what is possible and showing up for what is real! I also experience this feeling of impatience with the process of unfolding. I often have to remind myself that the way I show up for each moment is what I have control over, not how it all turns out!. The other thread that I love about your story is the role of the friend who seeded this idea. We can be so isolated and forget that we need support from others on our journey of becoming our truest self. The number of people that I have come to meet through this work has been another important source of energy. I have made instant connections and close friendships. I am constantly meeting other people who are trying to bring more depth into corporate life and learning about the amazing things that they are accomplishing. They have been so gracious in sharing their knowledge and resources. To be able to have conversations the like this one with you reminds me that I have this community and it is so fun. It’s definitely one of the best parts of this journey! I agree and I feel that! I like to call it the web of support. We can build communities that share resources and offer support. We can connect into this network of relationships when we need care. It can be an incredible source of energy, ideas, creativity and positivity. Listening and reflecting on the words that you have shared, I feel like that is what this paradigm shift is about - Remembering that we are all connected and then bringing this awareness of interconnection into every interaction that we have at work in schools and in all the ordinary moments of daily life. You have been so generous with your time. Do you have any final words? Yes. My encouragement is for everyone to look inwards, to listen deeply and to enjoy the journey, even when its not going the way you want. There is no better way to live. Beautiful! Thank you, Charles. I look so forward to checking back in with you to hear more about your journey. On March 21, I had the opportunity to interview Tara Clark. She is the powerful force behind the beautiful signs, shirts and hoodies that you have seen all over Seattle. Her campaign has resulted in $52,500 dollars donated in 2017 to organizations including KUOW, OneAmerica and International Rescue Committee as well as others. Here is an edited version of our conversation. Tara, I am super excited to be with you today! I am launching a new course Prepare To Pivot that I will facilitate with career consultant Christina McCracken. We are excited to help people who are ready to make a change in their career or ready to start a new project. People who are heading a call to adventure and creativity. I reached out to you because you are such a beautiful and shining example of tuning into an idea just as it is just emerging, envisioning what is possible and then engaging to make it happen. I am hoping to hear about the Spread Love campaign that you launched in 2017. And specifically (if you are willing) to kind of dissect it a bit. I am interested to learn more about the process that you went through. Often we don’t get to hear about the internal experience of a pivot and all the essential details. As a psychologist, I am very interested in knowing more about the key resources that were necessary to achieve success. I read that your pivotal moment really started against the backdrop of the Trump election. You were sensing that something in your life needed to change. What needed to change? I wanted to stand up for what I believe. I wanted to take a stand against the negativity and bombardment of hate. The messages that I was hearing and the sentiments being expressed weren’t in alignment with what I experience in my daily life and didn’t reflect what I know to be true about people. Once I recognized that I wanted a sign to state my beliefs that I could post on my front lawn, I started to investigate the cost involved. I realized it would be cost prohibitive for me to get one sign but to get 200 would be more affordable. This reality catapulted me into the Spread Love campaign, although the name for the campaign came about 4-6 weeks later when I realized that the signs were a gesture of spreading love. I have to be honest, the whole process was not well thought out and evolved organically! I knew that I needed to listen to my inner voice and not be afraid of the cost. That intuition carried me forward and gave me the energy and fuel to push it out into the world and sell those signs. I listened to my inner voice and trusted my experiences with past projects and just went for it. The Spread Love campaign expresses my conviction that we need to stand up for each other instead of listening to what is coming down at us. So you had this strong intuition to express yourself. You were called to put some positive language out there and express your belief in people - all people - to contrast and balance all the negativity and divisiveness. That is beautiful. I am curious, had you seen a particular sign that made you think “I want to do that! I want to put my ideas on a sign!”? Yes, I had seen on FB a white sign in the snow that had words on it that resonated with me. I hunted around and couldn’t find it. I didn’t start with a specific image but I went to an art store and was going to make a sign myself. While leading me to the materials that I would need, an employee at the store suggested an alternative idea that sounded better than me free-forming with paint and pens. He recommended that I look online, find what I like and then take it to Kinko’s to print. I went home and found another sign with fonts that I really liked. I reached out to the original designer, Kristin Joiner, who was living in Bermuda, to apprise her of my modifications and reflect to her how her design inspired me. I shared my vision for selling 200 signs and donating the proceeds to Seattle’s NPR affiliate, KUOW. I like that. Often when we have these powerful intuitions that something needs to change it doesn’t mean we have to do it all ourselves! It also doesn’t mean that we are the only person who has had that idea! I love it that the campaign started with your intuition and quickly moved you into a space of collaboration. Once I had the signs, I decided to get shirts made. Then I was talking with someone else and showed her what I had and she told me that that her husband, a professional graphic designer, didn’t like the graphics and they would never put the sign in their yard. And so I thought “Oh, No! I should change this.” I quickly realized that I had to quiet that inner voice that was saying “This isn’t perfect. This isn’t right. This won’t resonate with anyone.” At this point, I was not thinking beyond selling a few hundred signs and shirts. But I didn’t pay too much attention to the critical voice in my head. Instead I trusted my gut that there would be other people wanting to find a way to express their beliefs, too. I am hearing you talk about the Naysayer. First we have an idea. Then we start to engage and put some intention behind the intuition to get the wheels turning. This is often the point when the Naysayer shows up! With any process of change, any pivot, there will be barriers that we have to overcome. The way that someone recognizes limitations, overcomes obstacles and engages with barriers is what separates those who are able to pivot and those who aren’t. That internal dialogue can shut you down before you even get started. Sometimes the loudest Naysayer is within, so when other external Naysayers appear it can become a chorus of self-doubt! I struggle with that myself. This conflict between inner and outer obstacles never goes away. And it is important to remember that the Naysayer may be right! There may be some aspects of the information that we need to pay attention to and not just dismiss. Yes, if you engage with the Naysayer it can make you resilient and more able to tackle hurdles in the future. Often we take it as a total shutdown of our vision. But it is not a total shut down. It is something that you need to consider and learn from. I agree! Now, let’s take a moment now to consider the support that you received. I am curious, who did you turn to for help? I am not a great at asking for help. I am self-employed and used to doing a lot by myself. I will say that I got a lot of support from strangers. The first person was the printer. I was so excited to work with him because he was making my vision a reality. I started calling him Magic Mike because he just made things happen! I didn’t know him before and he is still an incredible source of support. There were other people that inserted themselves and shared their gifts and supported me and the Spread Love 2017 campaign. I will say that it has always been hard for me to ask for help. Now that I am a year in, I am getting better at taking people up on their offers to help. You do need at least one person that is encouraging you with a softer approach. You may want to rely on your partner for that support, but that can be difficult. I don’t know that they can be the primary support. They may worry and may not want you to fail. Someone outside can provide better support because they are not so intertwined. This is why with PTP we have set up a group and also will provide two facilitators. We believe that you need multiple layers of support and an experience of a healthy dialogue. We often want to get support from family, but this often times is not the most effective strategy and you don’t get effective and clear feedback. In PTP, we offer some practical strategies and opportunities to practice new skills so that the pivot can be executed with grace. Yes! When we connect great things happen. When we stand apart because of fear we can’t connect with one another. I want everyone to experience the power of connection and really see the beauty in one another. When we do this, we will all be uplifted. Your work has been so inspiring! I am excited to get to know you better. With PTP we hope to encourage people to tune into their intuition as they prepare to pivot. Each of us can cultivate more intention and engagement in our communities and contribute to the overall paradigm shift. Wonderful! Thank you Tara for sharing these words of insight and encouragement. I look forward to following Tara's work in 2018! We are curious to hear from you! Prepare to Pivot is grounded in our personal experience navigating a pivot and also our professional experience supporting others with their pivot. Our commitment to continued learning starts with inquiry. That's why we are reaching out to hear your process articulating a pivot. We would love to talk to you! Here are some questions that we are using to direct our interviews. Please consider setting up a time to talk or sending us the responses to these questions. If answering questions is not your thing, but you have a story to share, let's talk! When did your story of self-discovery start? When did you first sense that something needed to change? Let's start with how you heard, felt or recognized the call to pivot. You might have had a clear image of what needed to change or it may have been a more complicated and slow recognition that the path you were on had come to its natural conclusion. Walk us through this initial phase of insight when you discovered that something needed to change. Let's pay attention to the seeds, hints, and intuitive moments that you now know (in hindsight) were critical at this stage. Once you made the decision to change, what was the first step you took? What did you have to let go of or release? What did this feel like and how did you move forward once you had acknowledged the call. What were the surprises and insights that emerged in this final phase of integration? The final phase of your story captures the way that you made this your new reality. Tell us about the feelings you've encountered that helped you consolidate your new identity. Include the things that you had to let go of, mourn the loss of as well as achievements that you are still celebrating. Finally to summarize, what key takeaways and words of inspiration or encouragement would you offer to others as they prepare to pivot? Spring is here - renew your intentions! Today is March 1st. Can you feel the energy of Spring building as it propels us out of Winter? This is a special time to pause, sigh with relief, and celebrate that we have made it through the darkest time of year! On March 20th, we will experience the Spring Equinox and relish in the moment when there is balance between light and dark. It is just around the corner! Did you set intentions for the new year? How is that going? This is an ideal time to check in with those intentions, assess your progress and renew your focus. I am excited to support you in this process of self-reflection and preparation so you can actualize your intentions. Here in the PNW, this is a beautiful and challenging time when we are longing for warmth and sun (and we get momentary glimpses of both) but most of the time we are still dealing with cold rainy days and a unmet desire for more light. Remain committed to inner work in the face of these obstacles, and you may achieve your goals, objectives and dreams. If your resolve is insufficient, your commitments may wash away like the rain pouring down into the gutters. I am excited to offer two workshops this Spring at Seattle Mindfulness Center designed to assist you in cultivating your inner landscape so that you can manifest your dreams in the future. On March, 24th from 1-3:30 I will host Recipe for Resilience. You can expect to feel inspired and renewed through the 2.5 hour small group experience that combines creativity, mindfulness and movement. In silence and in dialogue, we will cultivate care and compassion for ourselves and others. We will review and discuss what contributes to resilience in individuals, groups and communities. You will have an opportunity for personal exploration to capture key experiences in 2018 that have already offered you opportunities for growth. Reviewing your intentions for 2018 and your journal, calendar, photos, cards and messages will help you to build your resilience. You will have a chance to consolidate your insights into a mixed-media collage. Please consider joining me as we co-create this circle of support. In April, I will launch a brand new workshop that I am co-facilitating with the brilliant career consultant and yogini, Christina McCracken. Inspired by the idea that a healthy life offers us many opportunities to change course, or pivot, as we move toward wisdom and maturity, we have co-created this platform to support your pivot. In the 8-session workshop, Prepare to Pivot, you will harness your energy, align with your purpose and execute your pivot with grace, courage and intention. The three phases of Self-discovery, Visioning and Action will be presented with clear action items and homework as well as inspiration and support. We are creating a workbook to accompany you on the journey and we are eager to incorporate stories and experiences from others who have a story of a pivot to share! The exact dates are TBD based on the group's needs. Registration is open and you can email me directly for more details or if you want to share your insights about a previous pivot!